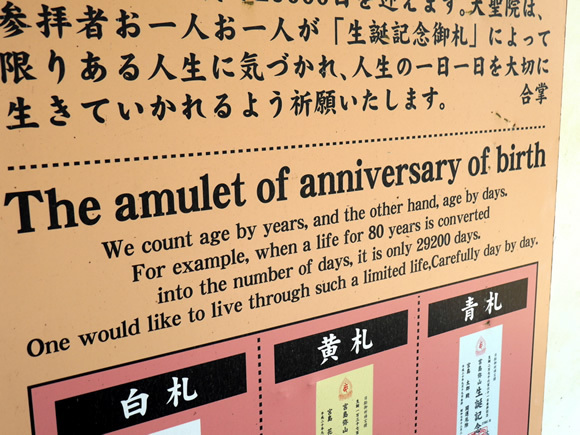 Okay, let’s say the bilingual journey lasts from birth to age 18—that’s 18 years, or 6570 days. (After that, our children are on their own and we can adjourn to our hammocks.) Now, if each day can be considered one step, that equals 6570 steps for the whole journey. But there’s a catch, too. These steps don’t usually head off into the horizon over flat land. No, for most who travel this way, these 6570 steps go up, up, up the side of a great, rocky mountain. These were my thoughts the other day as I sat brooding halfway up Mt. 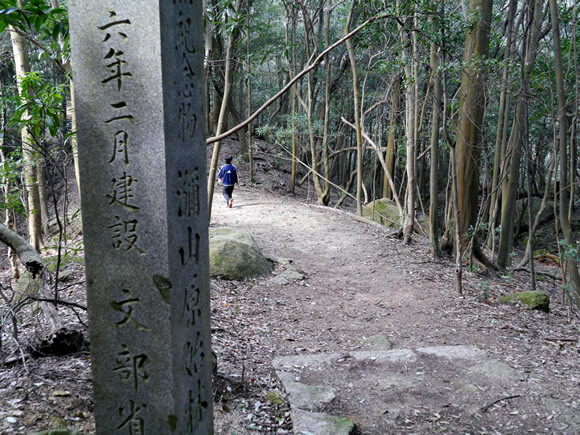 Misen, the mountain which looms above the well-known island of Miyajima. Though I’ve lived in Hiroshima for many years—and Miyajima is less than an hour from Hiroshima by train and ferry—this was the first time I had tried to climb it. “Come on, Dad!” my eight-year-old son called. 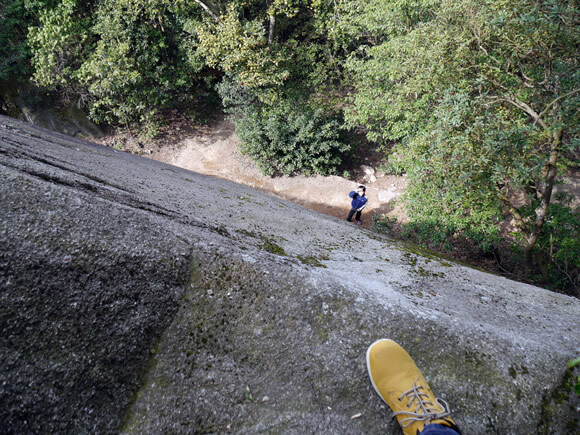 He had just snapped my picture and was eager to continue climbing. I was eager to continue sitting. I can’t say there are 6570 steps up the side of Mt. 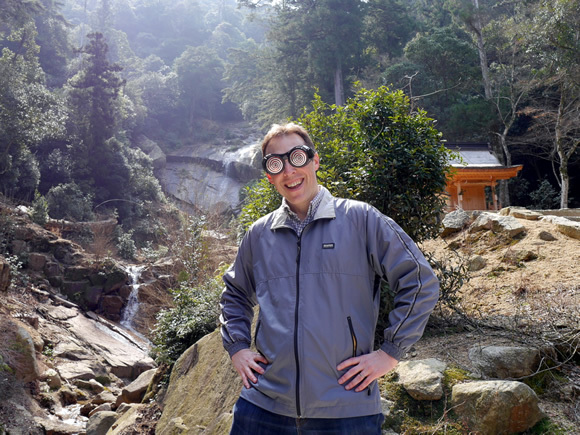 Misen, but it certainly feels that way. 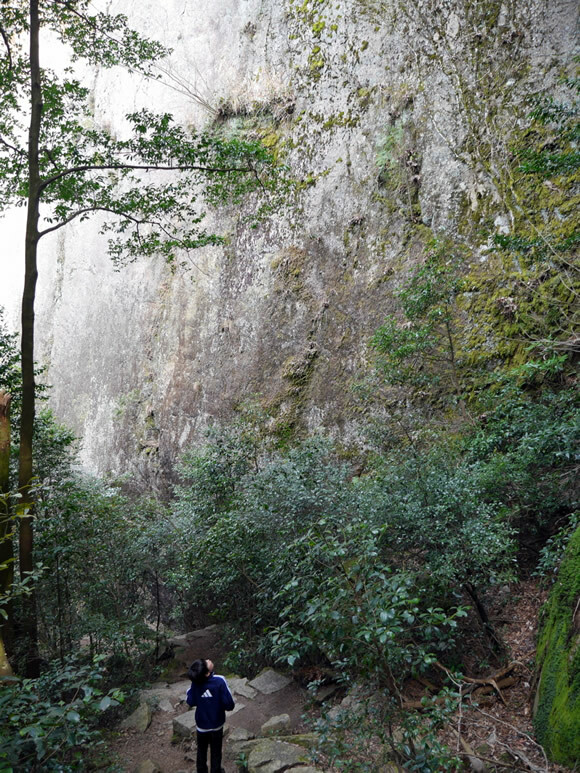 The stairs rise endlessly, more than two kilometers from the base of the mountain to its peak. And the truth is, I’m more of a lazy house pet than a lean beast of the forest. I mean, I like nature and everything, but I’ve never had much stamina. I was a sprinter in junior high, not a long-distance runner—and even then, I frequently hid in the bathroom during track practice so I could avoid at least some of the dozens of laps we had to run each day. But there was nowhere to hide now. I was on the side of a mountain, my son urging me to stand and stagger onward. I suggested several reasonable alternatives—only half in jest, frankly—but he shot down each one. In fact, one step at a time was all I could manage, anyway. I mean, it wasn’t possible to cover more stairs than that in a single stride (without tearing a groin muscle or something). And when I needed to rest, well, I would rest. I would sit down and moan for a moment, then I would rise again and go on. The bilingual journey is no different, really. 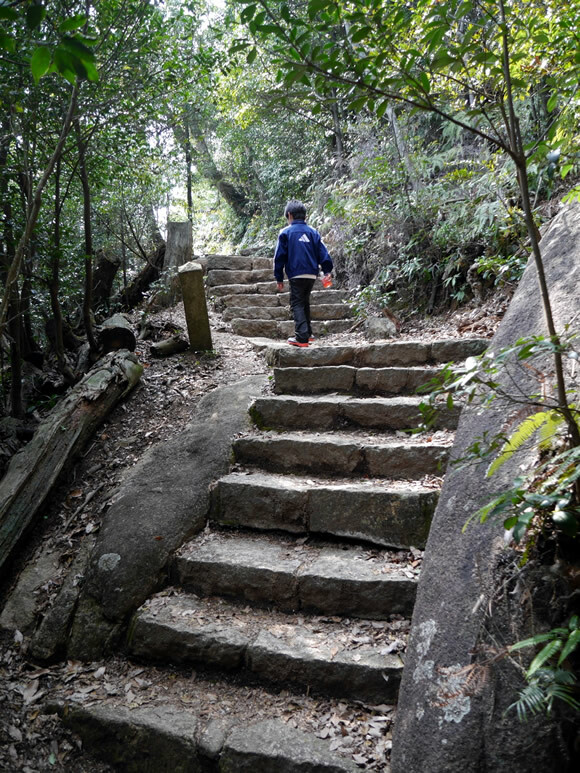 There may be 6570 steps, and they may be heading up the side of a steep mountain, but to cover this ground, you only need to focus on one step at a time, one day at a time. 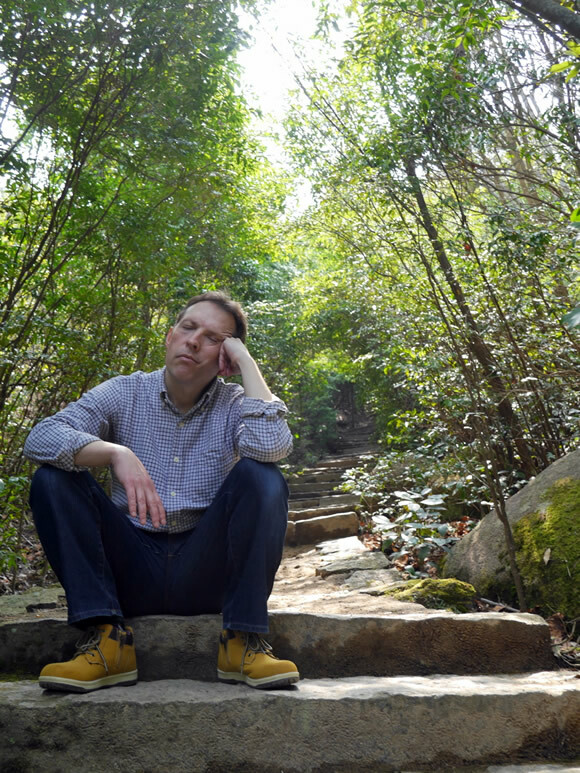 Each step takes some effort, it’s true, but if you simply plod on, with patience, perseverance, and as much playful joy as you can muster (and with moments of rest, as needed), the larger journey, and the greater goal, will inevitably be realized. 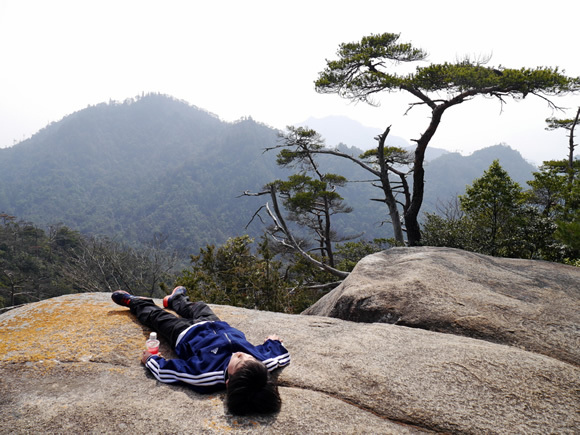 In this way, step by step, I reached the top of Mt. Misen. It took two and a half hours—and another two hours to get back down to civilization (tireless Roy again romping far ahead of me)—but I did it. 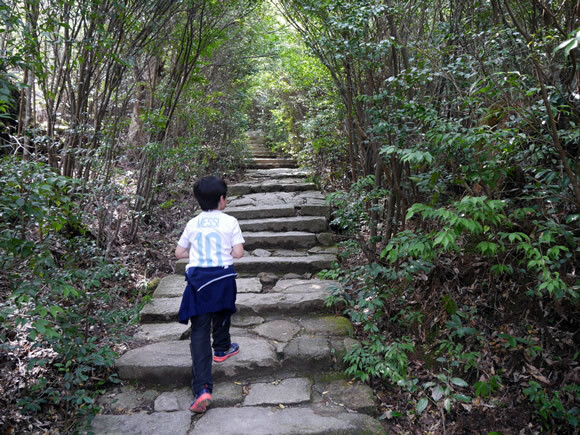 And though it was an exhausting hike, and my legs felt like limp linguini when I reached the bottom, the experience of that day—the rewarding adventure I had with my son—was well worth every bit of the effort it took. And let me stress again—as I first suggested in How Nearly Getting Myself Killed by a Kite and Having to Pay a Parking Ticket for $150 Helped My Children’s Bilingual Ability—that even the more difficult experiences we face, if we experience them with our kids in the minority language, become significant successes from the point of view of language development. The time I spent with Roy trudging up and down that mountain not only enriched our father-son bond, the intensive one-to-one exposure in the minority language enriched his bilingual ability, too. 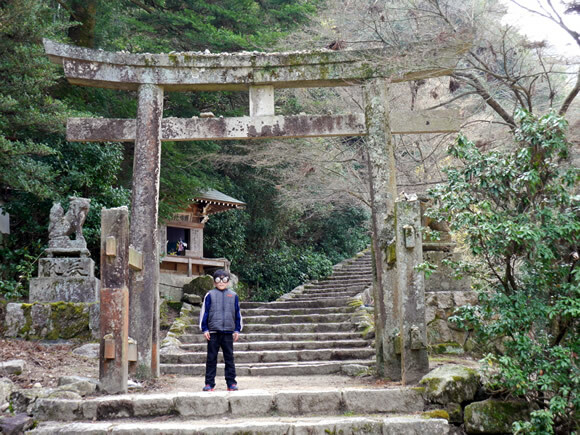 Revealing photos and video from Miyajima! To share our adventure in full color, here are more images from that day. Enjoy! 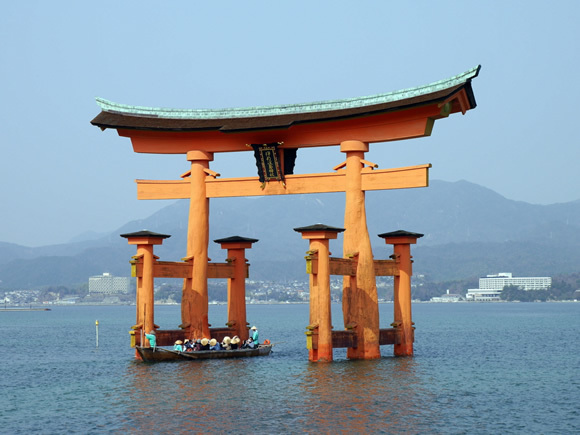 The famous “floating” shrine gate just offshore. At low tide (in the late afternoon), you can walk right out there on the soggy sand and touch it. 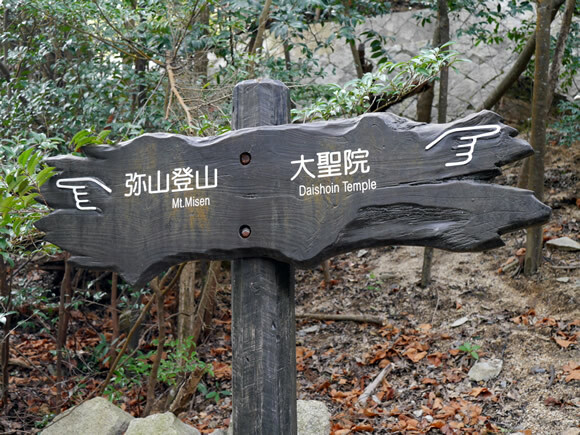 To reach the mountain peak, just follow this path, uphill, for over two kilometers. 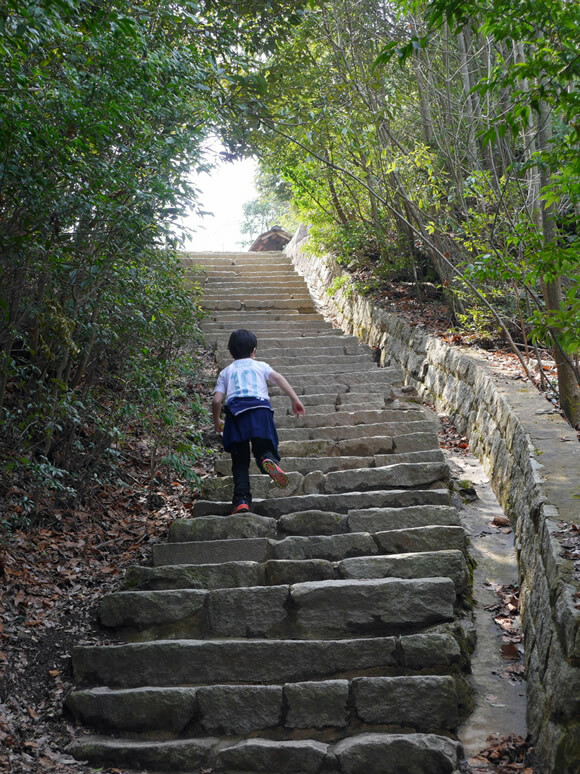 Ready to climb thousands of stairs? Pleasant waterfalls await you near the bottom. …which stretch into the sky. Closer to the top, we came across this small deer. 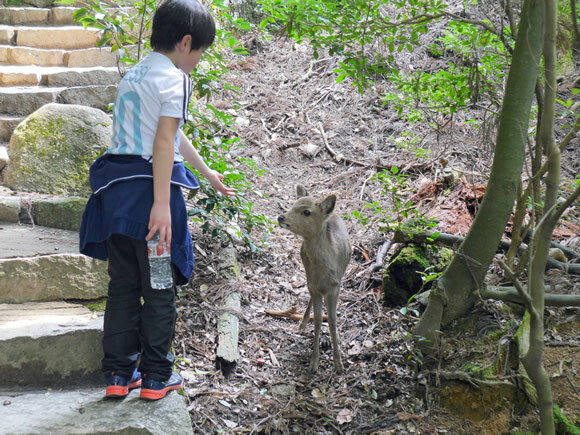 Miyajima is known for its deer, which have become accustomed to people. 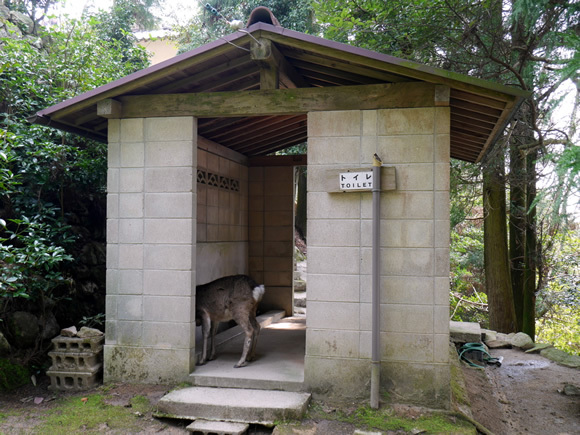 Did you know deer like public restrooms? 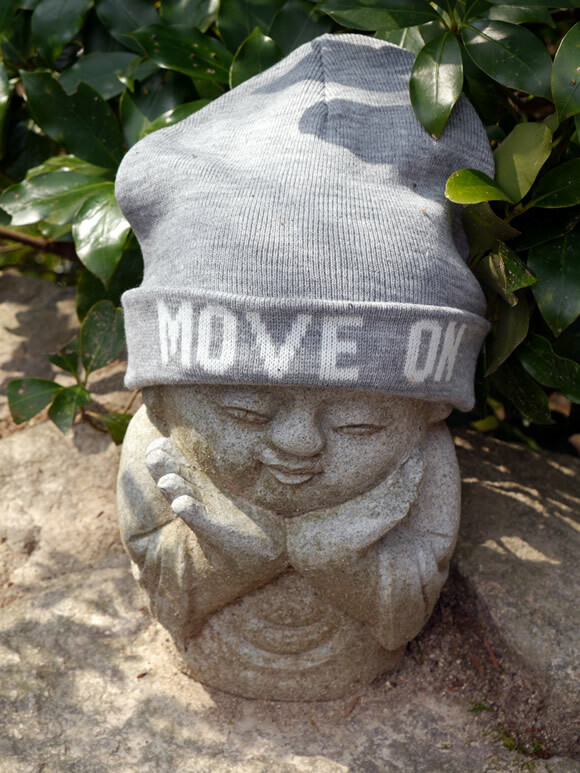 This little guy urges you toward the top. I found these wise words nearby, which suit today’s theme. Roy takes a well-deserved rest at the summit. After enjoying the wonderful view, and what was left of our egg salad sandwiches, we headed back down along a different trail. 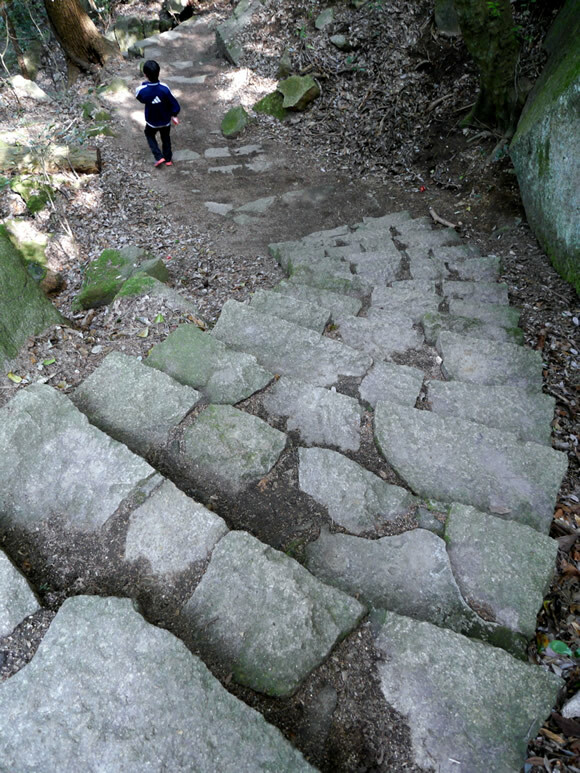 But even the path going down was dotted with stairs going up! 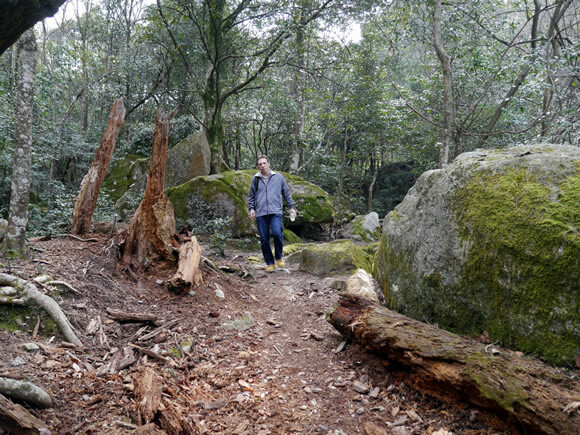 The forest is gorgeous, with huge rocks and trees. This is an unusually high step, isn’t it? We finally hit flatter land, to the accompaniment of frogs singing in a stream. I’m almost at the bottom, and ready to purchase a new pair of legs at the gift shop. Because the deer like egg salad sandwiches (and anything else that’s edible), they immediately respond to the sound of crinkling plastic, which they associate with plastic bags and food. And, finally, here’s a fun video which shows how excited the deer get over the sound of plastic! Simon, yes, I was a little concerned about that one deer with the large, sharp antlers. I could only hope he wasn’t in a goring mood. Great scenery for a great post. “One step at a time” I always try to tell myself or enjoy the journey not the destination! There will always be bumps in the bilingual road but let’s just make fun out of it. Let’s not only milk each day for language development, but for love and laughter as well. …because love and laughter will be filling our hearts and the hearts of our kids. 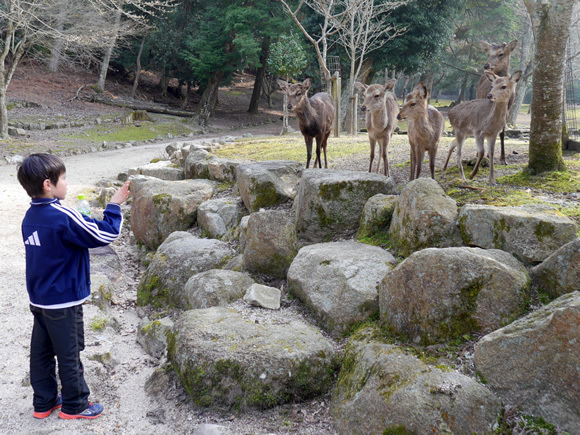 Dani, those deer come by themselves to you. 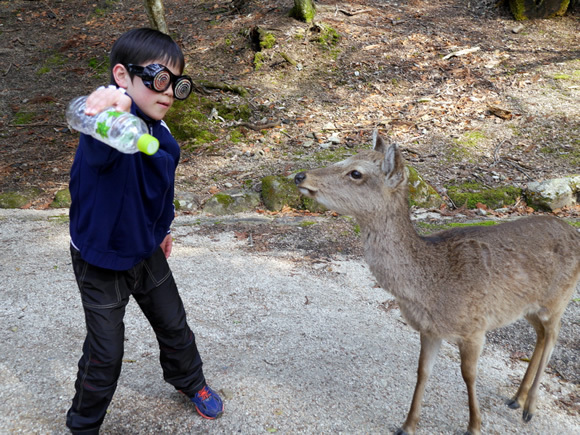 Many years ago I visited Nara in Japan where also many “plastic bottle deer” are living and you had to be careful if you were eating something because they will come and bite it away. Dangerous creatures! 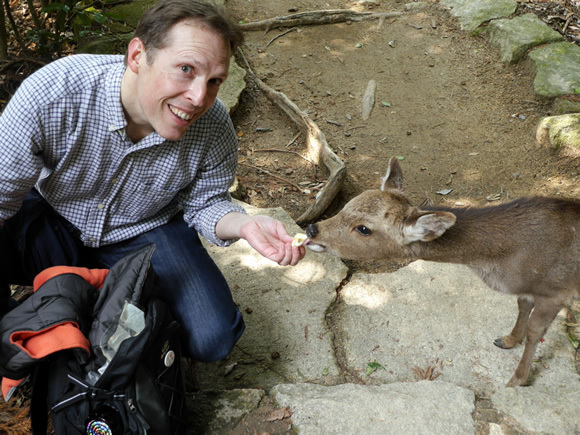 Yes, if you like deer, definitely take the “deer tour” to both Miyajima and Nara! I’m from Argentina and seeing your boy with a Messi t-shirt put a smile on my face… I read your blog when my 13 months old boy naps (like right now). I hope my blog continues to be a source of support to your bilingual efforts. I send best wishes from Japan!